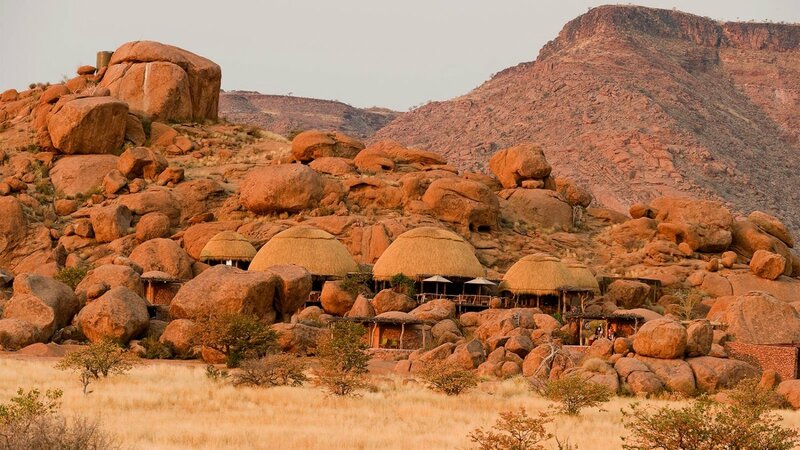 Camp Kipwe is set amongst large granite boulders and is situated close to the Aba-Huab River. The main area of the lodge includes a lounge; curio shop; bar and reception area. There is also a sparkling pool where guests can cool off and unwind. The lodge also provides laundry service. Accommodation at the lodge includes nine bungalows which offer twin bedded accommodation which can be converted into a double bed. Bungalows are equipped with air-conditioning; en-suite bathrooms with outdoor showers and ablutions as well. There is a thatched luxury suite with a lounge and is equipped with air-conditioning, satellite television, a double room with en-suite bathroom; laundry service and a mini-bar. Activities at the lodge inlcue Elephant/nature drives; Twyfelfontein, Burnt Mountain and Organ Pipes excursions as well as hiking.